No, it isn’t the start of a bad joke. I’ve been shaking my head since Tuesday morning. In case you haven’t noticed, yet again, Scripture is being confirmed in the news of the world. This is not intended to be intentionally callous towards Harambe, the now dead gorilla, or Jan Crouch, the now dead false teacher. It is intended merely to comment on events that have received incessant media coverage in the last twenty-four hours, and how those prevalent presentations confirm Biblical realities. First, a gorilla was shot in order to save a child who’d accidentally fallen into the primate’s zoo-defined quarters. The child was rescued. Yet, in our fallen world, the outrage over the death of the animal dominated the news coverage. Animal worshippers nationwide whipped themselves up into indignant wrath. 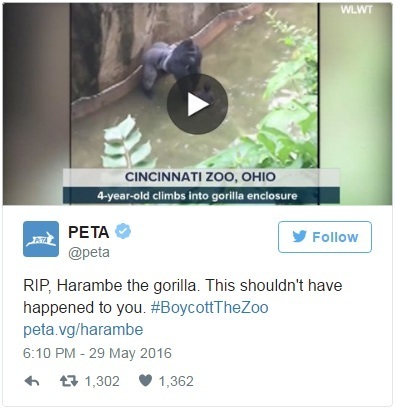 PETA, the recognized Sanhedrin-like, religious authority for animal worship, tweeted the following, calling for a boycott of the zoo that killed a gorilla (disregard that it saved a child). What we see displayed in the pixellated primate media coverage is, of course, not surprising to the Christian. One guy apparently even tweeted that mankind should be wiped from the face of the earth so that animals, like the dead primate, might thrive threat-free. So much for understanding that “have dominion” clause from God’s command in Genesis. Then, it is a lost world, in more than just a Jurassic Park sort of way. Skip over to the other news of the day and we find the death of Jan Crouch plastered around the media, particularly the “Christian” media. In Scripture, it is written, “Have I any pleasure in the death of the wicked, declares the Lord God, and not rather that he should turn from his way and live?” (Ezekiel 18:23) While God does not take “pleasure” in it, death is the result of our wickedness. The slightest sin demands divine, righteous judgment. We’ll all face it. So did Jan.
We’re at a point – and have been here for quite some time – where we must be intentional with the use of the descriptor “Christian.” It no longer means what it used to mean. It no longer means what it meant for those apostles and disciples who trod dusty Galilean byways under constant threat of persecution as they zealously pursued obedience to the Truth that had changed their eternities. 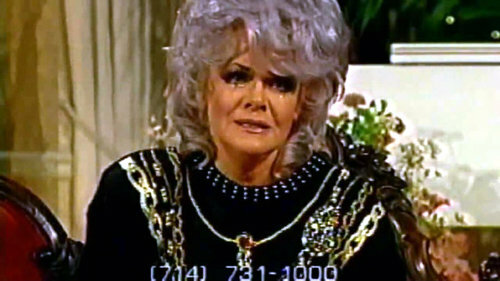 Jan Crouch did not pursue that Truth. She proclaimed what the New Testament calls an “other gospel.” In her case, as the Scripture-centric, authentic Christian knows, she misled millions with the false prosperity, word of faith gospel. In our proclivity for showing common decency, perhaps, we don’t speak ill of the dead. But in so doing, perhaps we’re failing to speak Truth to the living. The fact is – despite the endless pages of tweeted and Facebooked RIP’s for Crouch, proclaiming her “now in glory” or “gloriously reunited with Paul” or that “heaven has another angel” – if this false teacher died believing the heresy she proclaimed, hopes of her heavenly habitation are woefully misguided. Her false gospel does not save. Her Jesus is not the Jesus revealed to us in Scripture. Neither, MacArthur would surely agree, does the name “Jesus” offer us miracle-inducing, “name it claim it” abilities. Our words do not define our circumstances or change our lives. It’s the Word that does that. One wonders if the heretics over at TBN – were they not so distraught over the death of the reigning queen of televangelism – could pray for the resurrection of the dead gorilla. It would surely calm the tensions over in the PETA temple of animal worship. But, then, if they could really do that, why didn’t they do it for Crouch? Those of us who aren’t merely “Christian-in-name-only” understand why. The world won’t be saved by worshiping the world, or the chickens or gorillas in its midst. Neither will it be saved by worshiping according to the tenets of the false gospel proclaimed by the likes of Crouch. The true Gospel alone is the power that can save. Let us take no pleasure in the death of the wicked. But let’s not allow it, either, to cause us to be vague about the Truth. Those living in the land of the lost need to hear it.